Caught cheating in school. Should you defend yourself? A lawyer answers. You were caught cheating red handed. Your teacher saw you copying answers on an exam or cheating in another way. Should you try to defend yourself? Yes. Here is why. Should I just admit to cheating and accept the punishment? That depends on your universities academic integrity policy. A punishment for an honor code violation could range from a warning up to expulsion. You have to find out what your punishment will be. If you are facing a probation, suspension, or expulsion, you need to strongly think about trying to defend your actions. 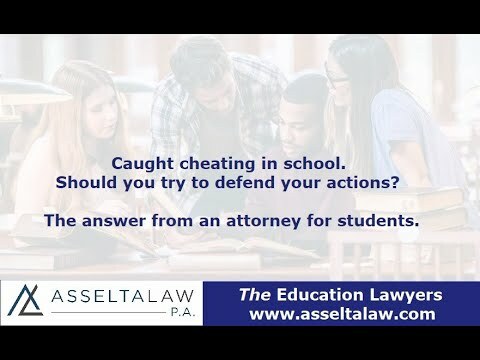 Why should I defend myself if I was caught cheating? Even thought you were caught and the evidence shows you cheated, there is still negotiation in your punishment. I have helped students all over the country reduce the punishment they are facing by using the college academic integrity process. How do I negotiate down my punishment for cheating? That depends on many factors and your specific situation. However, no matter what the circumstances, there are always arguments that can be made. Can you help me if I was caught cheating in school? Yes. I help students all over the country facing accusations of cheating. My specialized experience with the academic integrity process gives students the best chance at success.